Firefox on the work desktop was not playing nice; realising it looked funny, I did a version check and discovered it was stuck on 24.0 ESR. Normally Firefox updates automatically. To kick off the update process, go to Tools, About and the version checker usually appears below the version number. 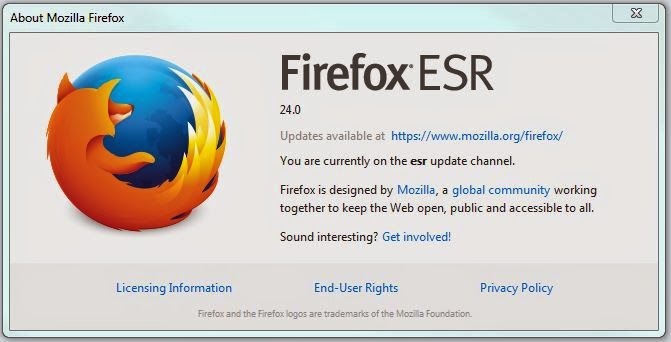 As Mozilla has a number of update channels, each with differing frequency of software releases, ESR seemed like a poor choice given I hadn't updated in six months. Working as I do on the web, that's equivalent to 4.2 years. 2. Go to the Firefox program folder. To check the change, open about:config (being mindful of the 'here be dragons' warning) in a Firefox tab and scroll down to: app.update.channel. The string on the right should be the one you chose. In my case, ESR - Extended Support Release - is designed for corporate IT types who don't want potentially instable releases from the other channels messing with their carefully imaged Windows clients. It seems changing the channel value in itself isn't enough. So I went there, downloaded the stub installer Firefox Setup Stub 35.0.1.exe, ran that, it downloaded the upgrade and then installed.